Hello! My name is Genevieve Locke. 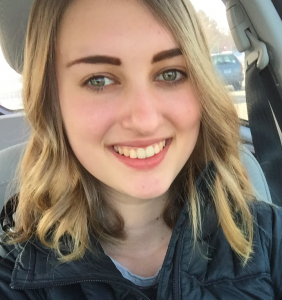 I am a sophomore at the University of Minnesota, studying Strategic Communication with an emphasis in advertising. I am also minoring in Digital Media Studies. I am the Sales Manager at the Minnesota Daily. I plan to go into a career in Account Planning. Outside of work and school, I enjoy running, crocheting, writing, and spending time outside. I am excited to head to Thailand, and I think that the trip will help me to grow both personally and academically. 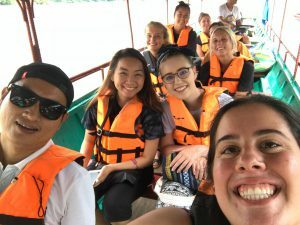 One of the main things that drew me to the Thailand program is that it has an interdisciplinary lens, and the program focuses on many different aspects of Thai culture. 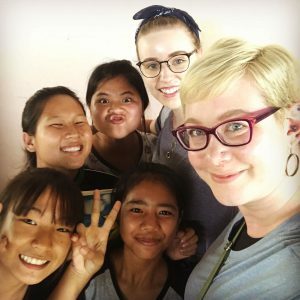 I am excited to learn about education, diversity in Thailand, the hill tribe communities, human trafficking, Buddhism, and many other topics during the trip. 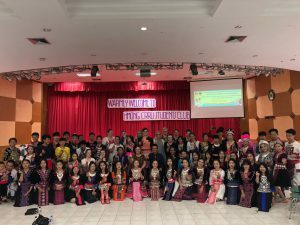 I think that it will be interesting to see how the different aspects of Thai culture are connected. 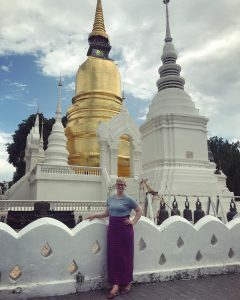 I like hands-on, experiential learning, so I am excited to learn about Thai culture outside of the classroom setting. I think that this program will round out my education by broadening my cultural perspective through new experiences. 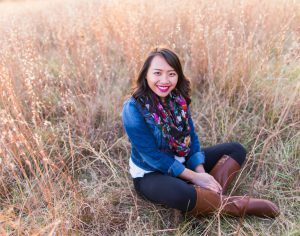 Because I am going into a profession in strategic communication, it is important that I understand how different cultural backgrounds affect the way that people process messages. I hope that this trip will allow me to immerse myself in a culture that is very different than my own. Personally, I hope to learn a lot about Buddhism on the trip. 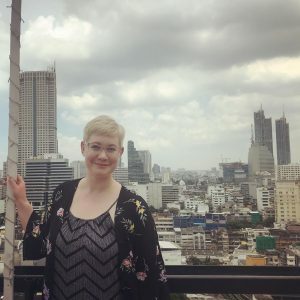 I have been very interested in Buddhism for quite a while now, so I am excited to have the chance to learn about the religion in Thailand, visit Buddhist temples, and talk to monks about their experiences. 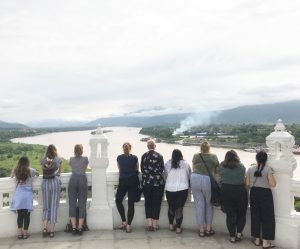 I also hope that the trip stretches me to step outside of my comfort zone and experience unfamiliar foods, activities, and places. I am very excited to see what the trip has in store! 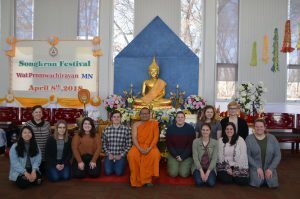 On April 21, 2018, our Thailand study abroad group visited Wat Promwachirayan, also known as Wat Thai, in St. Louis Park, Minnesota. When we first arrived, we took off our shoes at the temple’s entrance. Shoes and feet are not considered clean in Thai culture, so it is important to remove shoes before entering certain spaces. In addition, feet should always be pointed away from people, especially religious leaders. 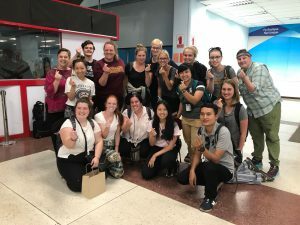 We were given a warm welcome by the woman who manages the restaurant Amazing Thailand and she explained a little more about the day’s activities and some cultural differences we should expect once we arrive in Thailand. Next, we participated in a Buddhist ceremony led by a monk. While the recitations were all in Thai, we actively participated in the ceremonial pouring of water. The man seated next to me informed me that it was fresh water for ancestors since it is unknown if people have fresh water after they pass on. Once the ceremony was complete it was time to eat! However, the monk must be fed first and at a separate table. We all gathered around his table, where all of these dishes were laid out for him to eat. We then helped bless his meal. The monk at Wat Thai eats twice a day before noon. After his last meal ends around noon, he may only drink liquids, such as fruit juices, the rest of the day. Some monks only eat one large meal a day and must cease all consumption of solid food at precisely noon, even if they are not finished. The food we ate was so delicious! 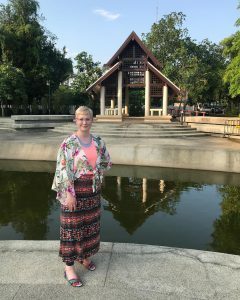 Everyone was so hospitable and welcoming to us at the Wat. We even got the chance to sit down with the monk and chat. He was so friendly and willing to answer all of our questions. 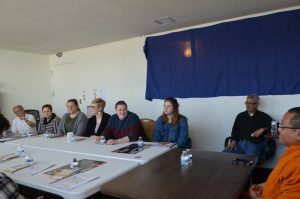 We learned about the rules that monks and other members in Thai society must abide by, as well as the differences that he observed between being a monk in Thailand and Minnesota. One notable difference is that he must do more errands and tasks on his own in America. 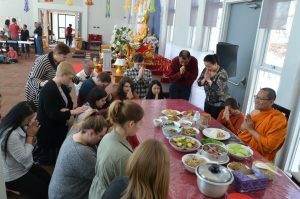 For example, in Thailand, monks will be offered food by other Thai people, whereas he must cook some of his own meals here in Minnesota. 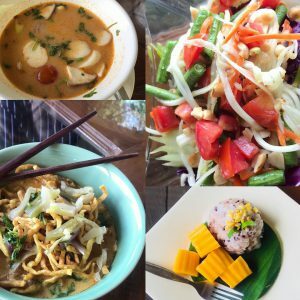 I cannot speak more highly of my experience at Wat Thai. It was such important cultural learning before our departure to Thailand. 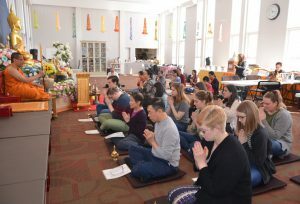 I want to offer my sincerest thanks to all of those at Wat Thai who opened up their temple and culture to us that Saturday.